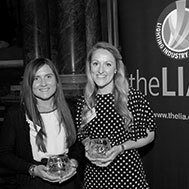 We are very pleased to congratulate one of our Sales Development Managers, Rebecca Walton, on her achievements having recently been announced runner-up at the finals of the LIA Certificate Awards. Last year Rebecca obtained a grade of A* in the LIA Lighting Certificate Course. The course consisted of three modules on which there were examinations, followed by a comprehensive self-study project. By completing the course Rebecca developed her knowledge lighting and a further understanding of lighting design and its applications. As a result of showing commitment and a depth of understanding in producing an outstanding project Rebecca was nominated as a finalist for the LIA Certificate Awards. This gave Rebecca the opportunity to present her project to a panel of adjudicators for assessment, before subsequently being invited to the prestigious LIA Awards ceremony in London for the results. With over 46 years of experience in product design Steon have a proud legacy of creating and developing innovative British made luminaires, the Prometheus LED is no exception. We have introduced a new surface / suspended high bay industrial luminaire, with IP65 ingress protection, suitable for application in production halls, warehouses and sports facilities. The Prometheus comes with a choice of four sizes and outputs, ranging from 10240lm to 77170lm and luminous efficacy of up to 164lm/W; making the luminaire extremely versatile. Additionally there are three optics available for flexible light distribution including a narrow beam, wide 60º and extra wide 90º. With a LED life expectancy in excess of 60,000 hours (L80 B10) the Prometheus is the perfect solution for projects where the luminaires are mounted at height as the fitting is virtually maintenance free. 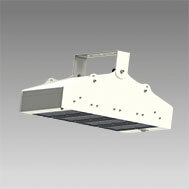 The luminaire has a die-cast aluminium heat sink for excellent thermal management. This industrial specification luminaire is available with integral three hour maintained emergency and is also compatible with intelligent lighting controls including 1-10V (analogue) dimming and integrated IP65 Remote Intelligent Control (RIC®). The Prometheus LED is also has an optional NTC sensor for over temperature control. For additional technical information please see our datasheet.